We have some exciting news to share with you: there is a new major release firmware available for the Omega2 family with a whole slew of improvements, the most important being that it comes bundled with OnionOS! 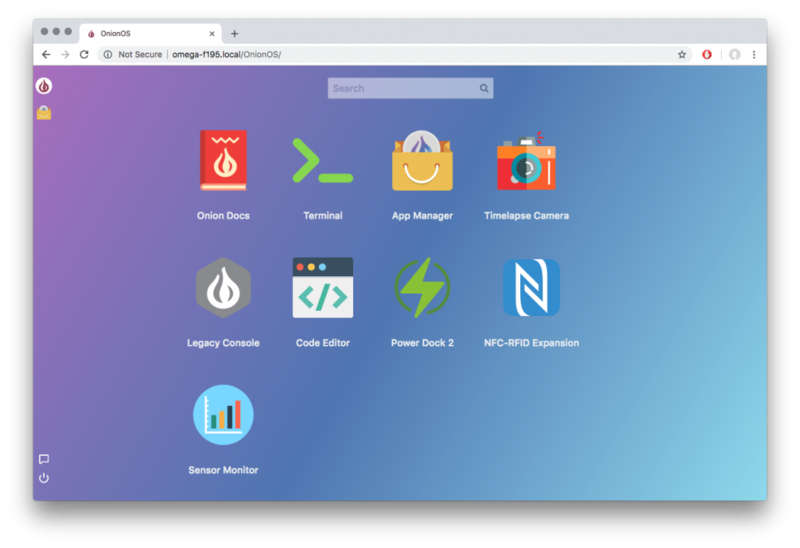 For those who are not yet familiar with OnionOS, it is a web-based, graphical user interface for the Omega2 family, with a number of apps that can be used to configure and control your device. OnionOS is hosted on your Omega and can be accessed by pointing a browser to your Omega’s webpage at: http://Omega-XXXX.local/ where the XXXX are the last four digits from your Omega’s sticker. Just remember that you’ll need to be on the same network as your Omega to access the OnionOS. This new release, v0.2.1 b198, is chock full of new features and improvements, and we can’t wait to tell you about them, keep reading to find out more! Last but not least, OnionOS comes bundled with the Omega’s firmware! We’ve been listening to your feedback and suggestions, and we whole-heartedly agree that the first time setup of the Omega should be as easy as possible. 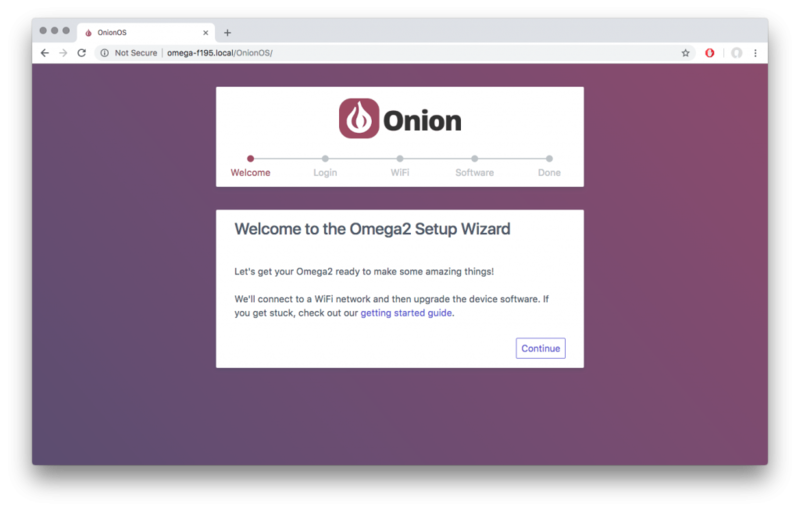 That’s why we’ve created a brand new Setup Wizard as a part of OnionOS that will streamline the first time setup of your Omega. The Setup Wizard is a graphical, browser-based way of connecting your Omega to WiFi and then upgrading the firmware if it is not already on the latest available stable release. Once the Setup Wizard has been completed, your Omega will remember that it has been configured and will instead load OnionOS! To bring back the Setup Wizard, run uci set onion.console.setup='0' ; uci commit onion on your Omega’s command line. The next time you point your browser to your Omega, the Setup Wizard will be back. Just note that upon completion of the Wizard, onion.console.setup will be set to 1, meaning OnionOS will be loaded instead. The App Manager is another new addition to OnionOS. With the App Manager, users can now install and remove OnionOS Apps with a few clicks, no more command line required. Clicking the Install button beside an App will start the installation process, you’ll see a loading icon in the button. When the loading icon stops spinning, the App will be installed. Click the Onion logo at the top of the sidebar to return to the main page and you’ll see the new App. Installed Apps will have a Remove button instead, that can be used to uninstall the App. 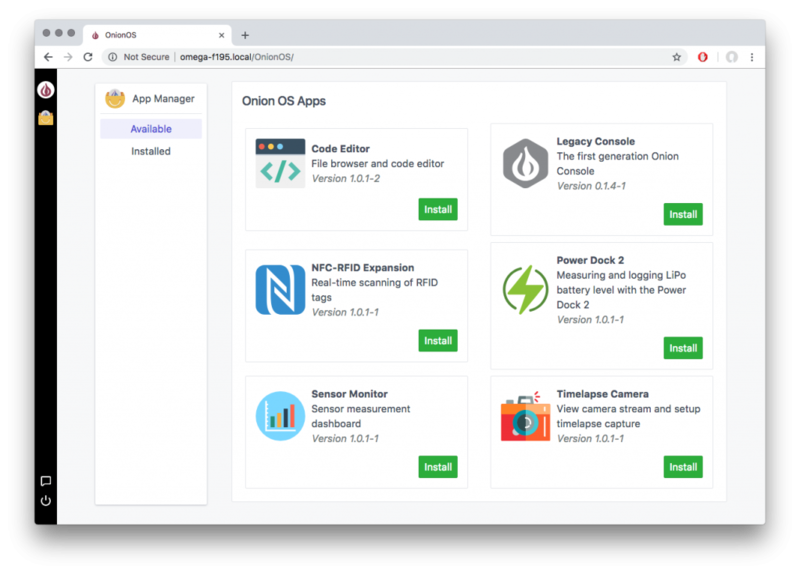 The App Manager checks the online Onion package repositories for OnionOS Apps, so as soon as a new App is released, it will show up in the App Manager. To our long-time users who still regularly use the Console (the predecessor of OnionOS), worry not, the Console is still available. It can be installed with the App Manager and then accessed through the Legacy Console app in OnionOS or by pointing your browser to http://Omega-XXXX.local/console, where the XXXX are the last four digits from the your Omega’s sticker. To successfully run the oupgrade command, you must connect to the Omega’s command line with SSH or via Serial. The command will not work from the Terminal app on the Console. Then you’ll be ready to go, point your browser to http://Omega-XXXX.local/ (where the XXXX are the last four digits from the your Omega’s sticker) and have fun with OnionOS! For best results, use the Google Chrome browser. Since the WiFi driver is 100% new, if you’re upgrading from firmware v0.1.10 b160 or earlier, you may have to go through some extra steps to configure your Omega to play nicely with the new driver. And then you’ll need to configure which WiFi networks you would like your Omega to connect to. This can be accomplished with the Setup Wizard or by running wifisetup on the command line. We would love to hear what you think about the new stable firmware, OnionOS, and the new Setup Wizard! Please let us know if you find any odd behavior, are experiencing issues, or want to give us some feedback by posting on the Onion Community or tweeting @OnionIoT. We want to make the Omega into a truly amazing product and we can’t do that without your help, so don’t hesitate to get in touch!